One way to bring more business into a practice is to explore outsourcing. Rochelle Glassman, president and CEO of United Physician Services in Phoenix, has worked with plenty of doctors who don’t think their practice is a business. “Some are profiting $20 [million] to $30 million a year and running it like the corner sweet shop,” she said. Their wives might be practice managers or a relative may clean the office in the evenings. “These are the ways doctors lose money every day because they are shortsighted,” she said. One way to bring more business into a practice is to explore outsourcing. While most physicians are comfortable using outside experts to come in and train on technical issues like ICD-10 conversion or HIPAA compliance, they are unaware there are external resources to make their lives easier or practice more lucrative. According to the Medical Group Management Association, each claim an office has to rework after a denial costs an average of $25. Of those that are returned, up to 65% don’t ever get reworked. This could equal a huge revenue loss. The goal of most practices is to bring as much revenue in-house as possible. Unless it is clearly less expensive to outsource a task, keep it in the practice, Glassman said. Because of this, large offices can often afford to keep billing in house. 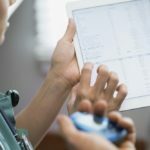 For larger practices, it often only makes sense to bill through an outside group if collections are “horrible and you are too busy to manage it,” or if space is so tight it is wiser to use a room for clinical instead of billing functions. For smaller groups, however – those with 3 to 4 providers – it often makes sense to have an outside group take over billing, she said. Doctors are accustomed to using outside vendors for filing taxes, but they should also be using these same professionals to perform a quarterly review of their financials. “I have a lot of clients who have had administrative people steal huge sums of money from them because they haven’t had an outside source looking over their shoulder to make sure the numbers are what they say they are,” she said. Glassman estimates that 90% of doctors have no idea how much they are being paid, where the contract is located, and what they are agreeing to when they sign. Contracts can come in without a fee schedule (instead they pay their “customary fees”). They may have stipulations saying a physician isn’t paid for certain services. Physicians or office managers may not think the contracts are negotiable (though most are). Many doctors she works with are getting paid well under market value and have no idea. Payer contract management can be crucial to the financial success of a business. Often, Glassman said, hiring a manager can net an extra 5% annually, and if an office is making $10 million a year, that’s no small change. One final area of potential outsourcing is one most physicians have not likely considered: marketing. When her mother was going to have shoulder surgery, her case manager gave Glassman a list of 25 physicians from which she could choose. Glassman compared that list with Medicare’s star ratings and then went onto social media sites to look up reviews on the doctors. Through this, she was able to narrow it down to only 2 potential doctors. Doctors can hire people to manage social media, such as by checking on their Medicare star rating and track and notify physicians of negative comments on sites like Yelp. “They need someone who can not only develop and build a web page but manage the social media aspect of practice,” she said. Vendors can also be used for patient recalls, appointment confirmations, or to check in with patients who have moved to another practice to find out why and if they would be willing to return. Vendors can often perform these tasks for less than $1,000 a month, which is likely less than paying staff internally. The only way to know if outsourcing administrative tasks is right for an office is to perform a cost-benefit analysis. Tabulate the cost of the staff time, upgrades, training and office space required to perform a task. Compare that with a quote from an outside company. Glassman said it’s important to include service in the equation as well. For instance, an answering service might cost more than having someone at the front desk taking messages. If patients are waiting for extended periods on hold, however, the practice may be losing out on new or returning visits. Glassman recommends getting quotes from 3 vendors for any task. Because of the rate at which technology and regulations are changing, it is important to make sure you are working with a consultant that is up to date. Lastly, don’t sign contracts for longer than a year, and always think about exit strategies upfront, she said. If you terminate a billing arrangement or switch to a different provider of electronic health records, it should be spelled out in the contract how the data will be transferred to a new system. Timelines and cost for this function are often not even included in a contract.